On Sunday evening, Chef Katsuya Fukushima was the "Visiting Dignitary" for the latest Cobaya dinner. 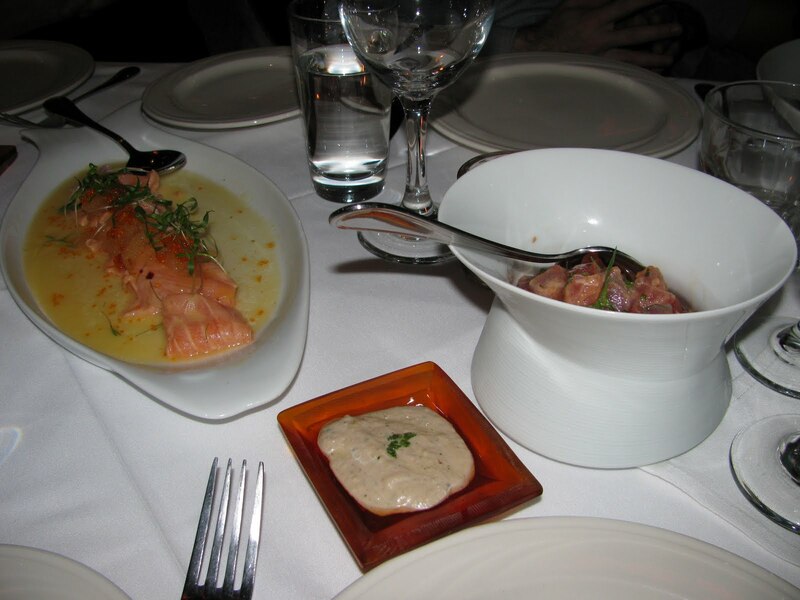 Katsuya for the past fifteen years has worked closely with über-chef José Andrés, including as head chef at the minibar and Café Atlantico in Washington DC. 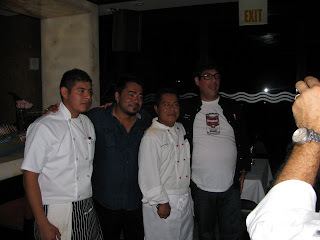 Local über-chef Douglas Rodriguez (Ola, De Rodriguez Cuba) was the gracious host at his not-yet opened new restuarant, De Rodriguez Ocean in the Bentley Beach Hilton on South Beach, and also contributed a few dishes. This dinner presented a lot of firsts: there were several first-timers in the group; it was Cobaya's first time working with an out-of-town chef; it was the first time doing a dinner with a group of this size (over 60). We always encourage chefs to do the kind of cooking they really want to do, and as a result we often get to see a side of their culinary repertoire that may not be apparent from the work they do in their restaurants. For Katsuya, who is perhaps best known for the cutting edge culinary hijinks of minibar (which you can see in this episode of Gourmet's Diary of a Foodie), this actually meant less high technique, and more of a focus on the cooking of his Hawaiian-Japanese heritage. The full flickr set of pictures from the dinner is here. While the group gathered at the bar, several passed hors d'oeuvres circulated around the room. I did not catch them all, but did get to try a couple: a potato-encased fried fish skewer spinkled with salt and vinegar powder, a perfect one-bite fish-n-chips; and a textbook crispy/creamy croqueta, with a filling of serrano ham, apple and curry. I missed the "ginger beer" cocktail, a highbrow/lowbrow combination of ginger juice, Domaine de Canton liqueur and Miller High Life. At the table, Chef Rodriguez started things off with a sampling of several ceviches, served family style. I've always loved the ceviches he's served at Ola, though I was less enamored of the ones I tried at his more recently opened De Rodriguez. These hit all the right notes for me, highlighting without overwhelming the fish. 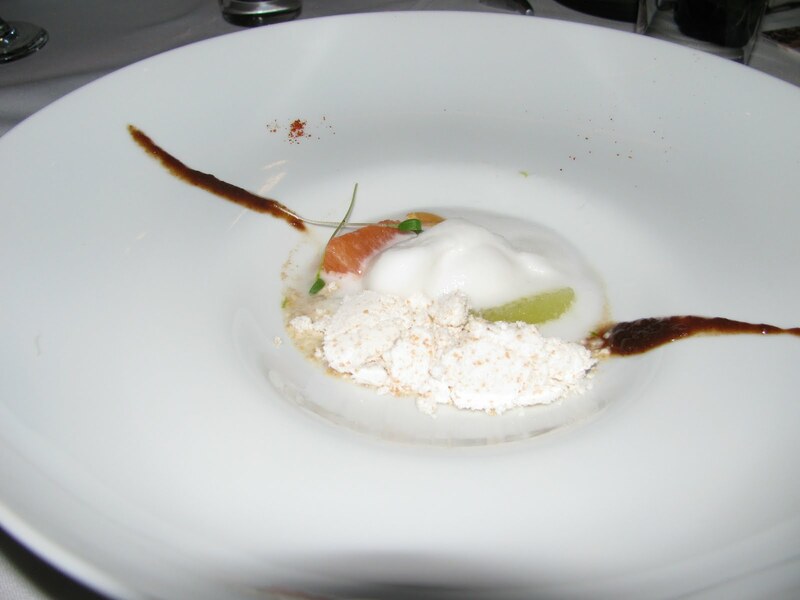 Ribbons of salmon were paired with citrus and micro-herbs, while cubes of tuna were matched with cubes of watermelon, acting as their visual doppelgängers. 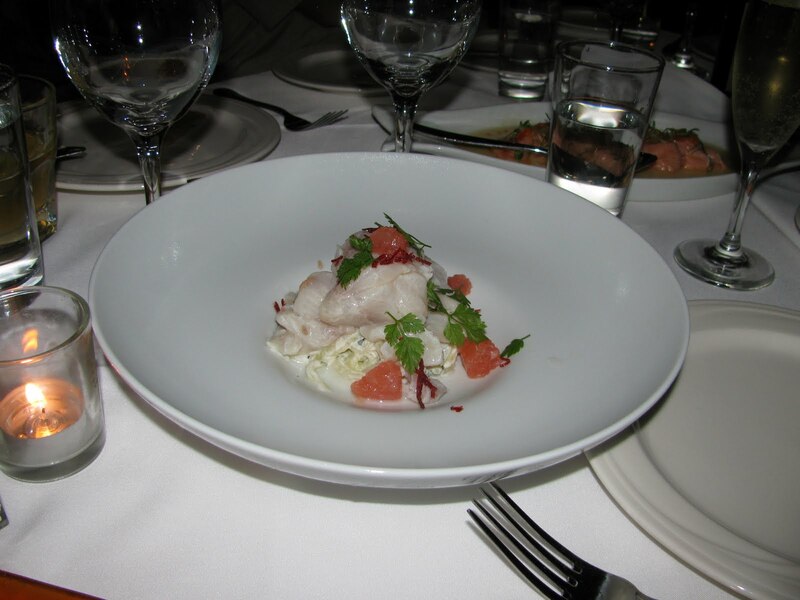 The exotic sounding "tambour rouge," procured from a sustainable farming operation in Africa, had buttery, hamachi-like flesh that was nicely paired with pickled fennel and grapefruit segments. I thought each of these had great balance and flavor, though the poke-like tuna was my favorite. Chef Katsuya then presented an elegant dish, which combined red and yellow tomatoes, burrata cheese, sea urchin, dashi gelée, baby arugula, micro-greens and rose petals. This was in part a study of "umami," with several of the seemingly disparate components being prime sources of the glutamates responsible for the "savory flavor" - tomatoes, uni, the double-whammy of kombu-bonito dashi. 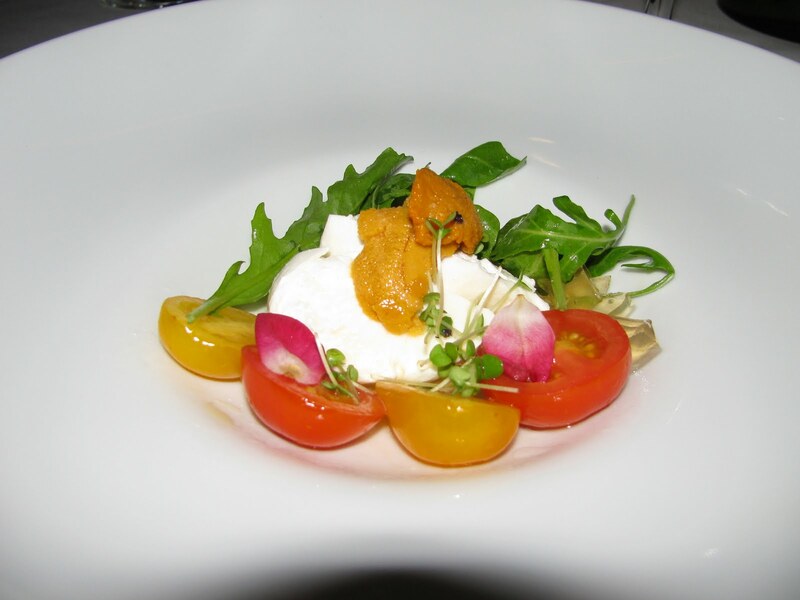 Some cheeses are high in glutamates as well, though mozzarella or burrata not so much; rather, I saw the cheese as being a textural mimicking of the creamy uni. The dish broke the customary taboo against pairing seafood and cheese, and I thought it did so to very successful effect. Each of the components provided its own unique savory flavor profile, and yet I thought they combined surprisingly well together. The fragrance of the next dish started to fill the room even before the bowls hit the table. There is something that is just magnificently pleasing to me about the aroma of cinnamon, and I wonder if this sentiment is universally shared. 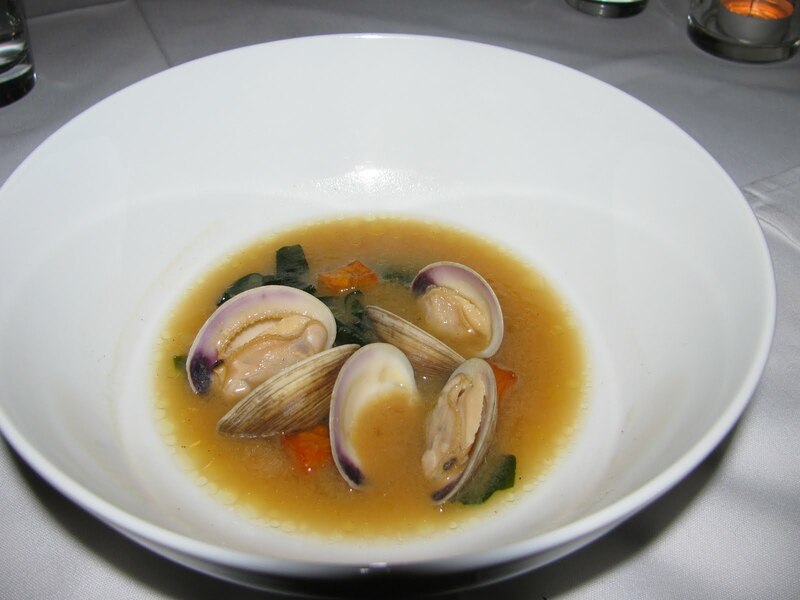 This soup was a fairly straightforward miso soup with clams, but the cinnamon-infused broth took it in an entirely new direction. Like the uni and dashi with burrata, cinnamon and seafood was not a combination I would have expected to work, but it did. 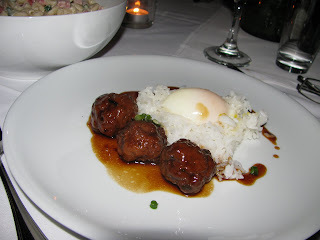 This was probably the most divisive dish of the night - Chef Katsuya's take on loco moco, a "traditional" (post-WWII traditional, anyway) Hawaiian comfort food. The story generally told is that "loco moco" was the creation of a Hilo restaurant sometime around 1949: the cross-cultural mash-up in its original form involves a hamburger patty over a mound of white rice, topped with a fried egg, and slathered in gravy, and it is now ubiquitously served as a "plate lunch" throughout the islands. Katsuya's version substituted albondigas (the Spanish word for meatball sounds much more elegant) for the burger in a rich, densely flavored gravy (truffle was mentioned though I didn't pick up much sense of it), and a 63.5°C immersion-circulated egg for the fried egg. Another traditional component of the Hawaiian plate lunch is macaroni salad, notwithstanding the combination of starch and starch, and Chef Katsuya added still another Hawaiian tradition to the mix by spiking his with Spam. One of Douglas Rodriguez's pastry chefs contributed a pre-dessert that was a sweet spin on a Cuban classic. Moros y cristianos, or Moors and Christians, is the traditional Cuban dish of black beans and white rice, cooked together. This version combined a black bean ice cream with house-made rice crispies, some bacon brittle and a cherry drizzle. It was a clever idea and I thought the flavors worked, even if they tasted almost entirely unlike their original source, the only misfire being a somewhat grainy texture to the black bean ice cream. The final course was Chef Katsuya's spin on a dish I had at minibar a couple years ago. The components included coconut sorbet, peanut butter powder (accomplished with the use of tapioca maltodextrin), tamarind, grapefruit and lime segments, micro cilantro, and cayenne pepper, and in combination they hit all the flavor notes of a pad thai. The classic balance of salty, sweet, sour, spicy and bitter present in Thai cuisine is re-jiggered for dessert purposes here, and I really enjoyed the combination. As always, it's immensely gratifying to see the support of the Miami community for these "experiments." If you're interested in being a guinea pig, there's more information here at Cobaya | Gourmet Guinea Pigs. Many thanks are due to Chef Rodriguez for his generosity in offering up his space for the dinner, and also for all the support provided by his staff, both in the kitchen and front of house. Cooks came in from all of his restaurants to help out on Sunday, which is usually their day off. Also, a really loud shout-out is due to Jeremiah Bullfrog, chef/owner of the gastroPod, who was instrumental in bringing Katsuya into town and putting this dinner together. It was also great seeing Chef Kurtis Jantz, a multiple Cobaya alum, helping out in the kitchen too. Eventually it occured to me that "tambour rouge" = "red drum" in French, somewhat less exotic. One of the guiding principles of these dinners is that we give the chefs an opportunity to cook the food they really want to cook, and to do things they don't otherwise get an opportunity to do. For chefs in more traditional restaurants, that often means more experimental cooking; for a chef like Katsuya whose stock-in-trade has been contemporary cuisine, that meant a return to his roots. I think some diners were frustrated with this dish being the "centerpiece" of the meal (particularly given the price point) and as a fellow diner, I empathize to a certain degree with those sentiments. For me, anyway, it's not the inclusion of such a dish in a "high-end" meal as that I'm not sure the execution was sufficiently elevated to suit the context (Animal in Los Angeles has a now-infamous version of loco moco that sells for $35, though topping it with a slab of foie gras helps justify that price tag; more good back-story on loco moco and Animal's version in this piece, Cuckoo for Loco Moco). I think the addition of one more savory course to the menu would have helped alleviate these concerns, and/or perhaps converting some of the passed hors d'oeuvres into a plated course at the table. Unfortunately, when you do passed hors d'oeuvres in a crowded room, it's difficult for everyone to try everything, and often their impact can get lost in the shuffle. We try to learn from every one of these experiments and make them better every time. 1) A crisp shell fish taco with smoked marlin with some variation on the typical fixings. 2) An oyster shooter with some yuzu juice and a soy(?) gelee. 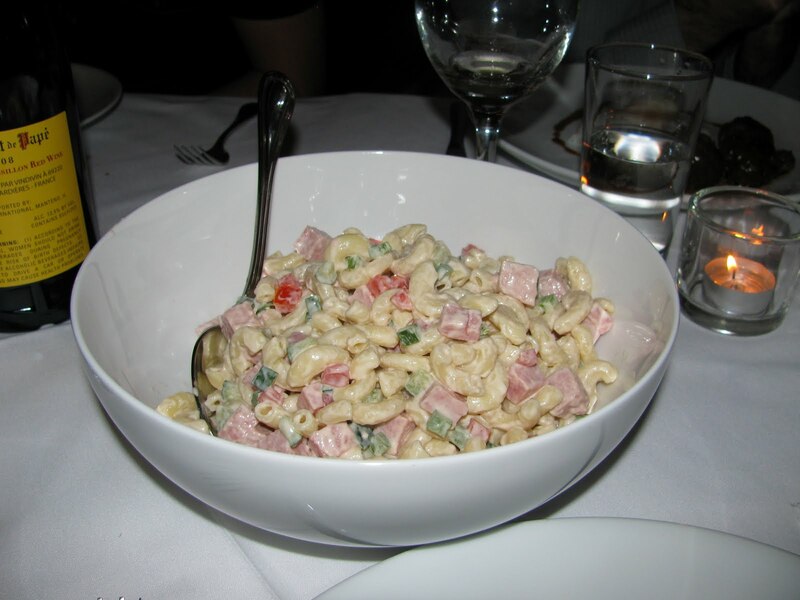 3) A clam served with some kind of slaw, the composition of which eludes recall. The clam had some crab in it too and had some hard-to-identify crispy bits. It was the best savory dish of evening, I thought, although that bar was disappointingly low. 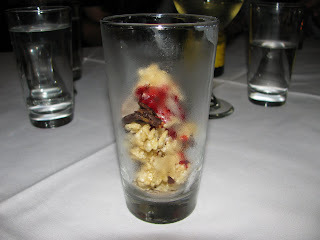 I quite liked the Thai dessert, though. That addition of cinnamon in the miso soup was definitely one of the most interesting flavor combinations I've had in a long time, even though I felt it was a tad too salty. I also thoroughly enjoyed the Thai dessert. 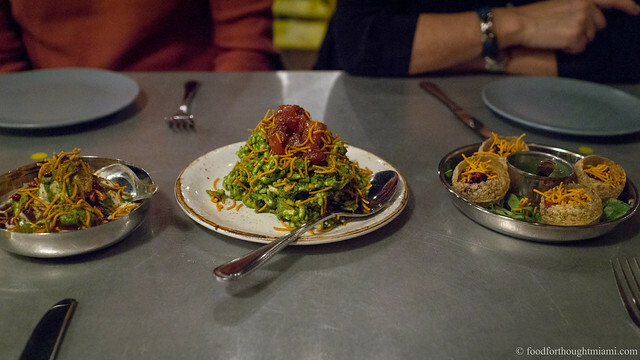 A beautiful deconstruction and play on the flavors of Pad Thai. Does anyone have more pictures from the dinner posted online that?